Over the last months we have seen the scaffolding go up in the Stegerwald settlement where we aim to implement a range of integrated solutions and talked to citizens, we have our data platform which is now in its first stages of being set up and our mobility hubs where we have run in to some issues…! Germany’s buildings account for almost 37% of the country’s greenhouse gas emissions (2010). Houses from the 1950s, like those in the Stegerwald Settlement, tend be lightly insulated. It is common to find attics with a single layer of insulation and walls with insulating values that are much lower than that required in new homes. As part of Cologne’s commitment to the Mayor’s Covenant and “Klima-Bündnis” towards improving energy efficiency, we are working to create next-generation properties without these fundamental flaws to address the growing concerns over energy consumption, working towards a more sustainable future. In the GrowSmarter project 16 multi-family homes in the Stegerwald Settlement will benefit from a number of integrated solutions. In the middle of August 2015 we were pleased to see the scaffolding going up in the Stegerwald Settlement district. The buildings will have to adhere to Germany’s Energy Saving Regulation (EnEV) (last amended in 2014) which sets out thermal insulation standards for residential and commercial buildings. The regulation sets out values for the construction of new buildings but not for existing buildings. Therefor were are using empirical values. The partners RheinEnergie, Dewog, and AGT have teamed up to provide measures for the tenants living in the Stegerwald Settlement in Cologne. 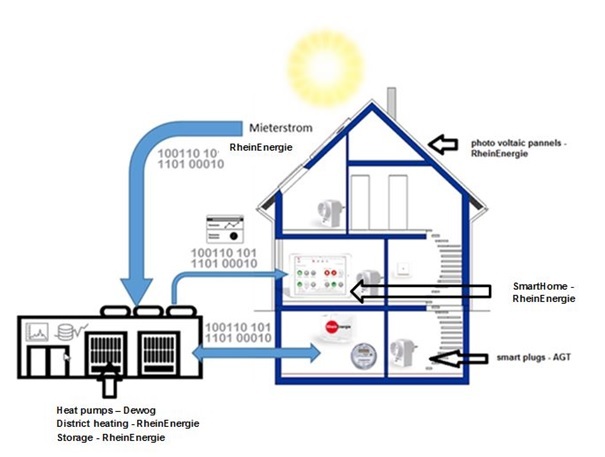 In order to reduce the lead and consumption of primary energy, in the Stegerwald Settlement, RheinEnergie will install electric storages, PV, a district heat connection and heat pumps (by DEWOG) in the next two years. These all will be managed by a software like a software for a virtual power plant; called “Siedlungsmanagement”. At the same time DEWOG will implement energetic and structural measures. Within the project GrowSmarter some apartments (50 to 100) will get a SmartHome equipment to save electricity and warm water for heating. The third partner, AGT International, will provide its expertise in acquiring energy consumption data on device level and its proven comprehensive data analytic capabilities developed in the BMWi funded project PeerEnergyCloud. Energy consumption will be measured by Smart Plugs transmitting the data wirelessly and securely to a local gateway. Data will be pre-processed, anonymized and send via a secure channel to the backend systems. Here, advanced data analytic components will provide insights into the consumption behavior. In a first step RheinEnergie, Dewog and AGT are developing a concept addressing the tenants in the Stegerwald Settlement about the benefits using Smart Energy solutions (2015-November-24). Additionally, a technical feasibility study is currently planned and will be realized in the next months. Something very new for us is our foray into expanding our digital infrastructure in the form of our open data platform www.offenedaten-koeln.de, an official site providing free access to a number of data-sets from Cologne. We believe data is a source of massive potential value for cities to enable sustainable growth and tackle environmental and economic challenges. By technologically enabling the city we hope to tap into this potential value to create a fully-integrated, strategically-designed smart city; a concept which is also at the heart of the GrowSmarter project. So, how does the platform work? Well, together with our partner ui! – the urban institute which is providing the software architecture (based on its platform UrbanPulse) and Microsoft, which is providing the Cloud infrastructure, Cologne plans to make city data available to citizens — securely and affordably. 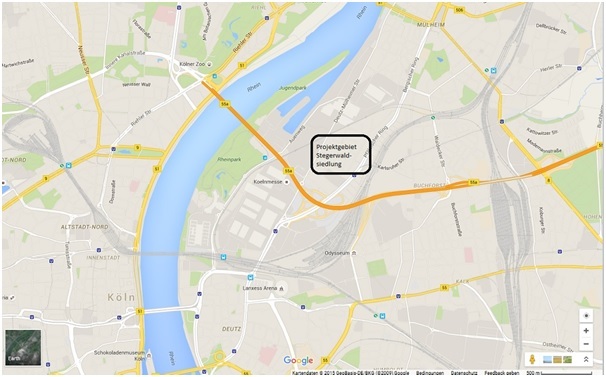 UrbanPulse gathers existing sensor data, such as data from Cologne’s traffic management system, and displays this data as annotated street maps via a web server. The data platform is now up and running with users able to access and download non real-time traffic flow data. We are not quite at the stage of being able to offer real-time data, but we are working on it and exploring additional data sets which could be incorporated e.g. the road construction sites. This initial platform was demonstrated at the International Automobile Exhibition (IAA) in Frankfurt as part of the New Mobility World. An on-going discussion with the City of Cologne in the development of this platform has been a concern about privacy issues. So far, all data comes from urban sensors and no personal or individual data is being stored or used. But as we look at expanding the data sets for example to include energy related data, this issue will be addressed. A second issue is the security of data. One of the reasons to choose Microsoft Azure® has been because it is the only leading provider of cloud services to support the world's first international standard for data security in the cloud, known as ISO / IEC 27018 , and developed by the International Organization for Standardization (ISO). The standard aims to create a uniform and internationally valid concept to protect personal data stored in the cloud. Ultimately we hope by unlocking public data and making it available to interested citizens, entrepreneurs and organisations to open up new value chains that spawn innovative and smart solutions which in turn boost sustainable modes of city living and working. Mobility hubs – when do public and private interests overlap? 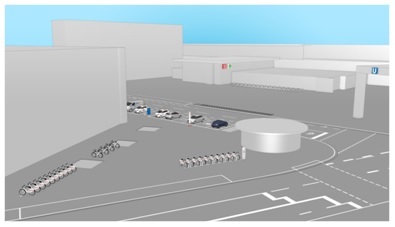 In an attempt to reduce traffic on the roads three “mobility-hubs” will be installed as part of the GrowSmarter project. These hubs are comprised of several car sharing lots and also space for people to park their car a little way outside of the city centre and to take one of the provided E-Bikes to complete the rest of their journey. In addition there is the possibility to charge E-Cars. The energy to charge the E-Cars will be produced at the multi-family homes which are being refurbished (mentioned above). But we have run into some issues! According to German laws, public ground can’t be used for private (profit-making) purposes, e.g. car sharing services offered by Ampido. So these hubs have to be installed on private ground. I will be back soon with more experiences with implementing the first smart solutions in Cologne in the next blog, but please feel free to share your thoughts and experiences this far in Cologne. Almost one year ago work on the Stockholm site started in GrowSmarter. Looking back at this year it has been a trip back to the future. The future as being the smart city with all the innovative solutions that will be implemented in Stockholm. What we learned during this first year is that a great future is built with a thorough understanding of the past and present. There are logical reasons why the city is built and organised in a certain way. Creating a smart, sustainable city is a question of using the existing structure, adapting it, or creating a new one. The GrowSmarter project are doing all of these to create the smart city of Stockholm. The goal of the City of Stockholm is to lower its CO2 emissions to three tons per capita by 2015. We are working hard to make energy consumption more efficient in the city’s own properties, committing to the Covenant of Mayors with our Sustainable Energy Action Plan and as part of the GrowSmarter project create more low energy districts. In the suburban area of Valla Torg in Årsta, built at the beginning of the 1960’s, a number of smart solutions will be implemented, from energy efficiency measures to smart lighting, smart waste handling and sustainable mobility. One of our key areas of work is also refurbishing six residential buildings in the area which currently have 302 apartments. In line with the GrowSmarter concept of integration and our own philosophy in Sweden towards sustainability which involves using what is already there and adapting it to today’s standards. Inside, the buildings will contain a lot of new technology, with very small changes made to the facades. The energy efficiency measures implemented in the residential buildings will reach an energy use level that is lower than the requirements for new buildings in Stockholm and the level of near-zero-energy-buildings in Sweden, beating the 25 percent reduction in energy consumption after refurbishment outlined in the Building Regulations (BBR) of the Swedish National Board of Housing, Building and Planning (Boverket). To achieve these stiff targets, we have been working on understanding the existing structure, its limitations and possibilities to see how the solutions can be implemented for best possible results. Over the last year we have conducted detailed discussions, expert statements, pre-studies and computer simulations the implementation plan is done and we are ready to turn the clock back to the future and start the rolling out the solutions at the beginning of 2016. 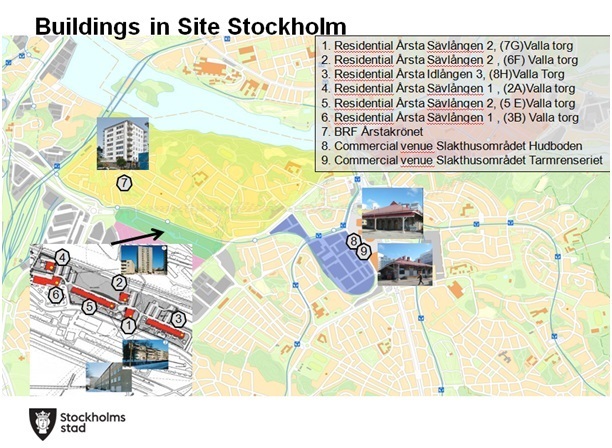 Source: The Swedish Property Federation (Fastighetsägarna). Another interesting process during this past year has been related to the buzz words ‘Internet of Things’, ‘Connectivity’ and ‘Big Data’. Stockholm has good connectivity throughout the city but how could we use what is already there and take Stockholm to the next level to become a smart, intelligent city? To answer that question we needed to firstly understand how things currently work in terms of city processes and functions, and also end-user value, secondly where development in this sector is headed (what kind of connectivity, data will be required in 5 to 10 years from now), and thirdly to find a place in the city where the impact would be greatest and instantly valuable for citizens. This spot was the Slakthus area. The challenge with Slakthus area and its digitalisation is not just the implementation of technology; the technology could be up and running in three months - the challenge is to understand all the city’s different needs in the Slakthus area, and get different functions in the city to join up and use shared sensors, Wi-Fi, big data. We want to avoid having lots of different data platforms working in parallel and instead have them working all together in an integrated way. For instance, measuring pedestrian flows would be useful not only to control the brightness of street lights, but also for street maintenance. It thus became clear that there is a huge need for integrated approach and that this needed to be addressed very early in planning processes. Bringing together key individuals from different departments in the city, from city planning, traffic department, development department, real estate department, IT department, environmental department, and the city owned fibre-network company, we held a first an internal workshop in August 2015 to discuss how this area will be in 2030 and to understand, how digitalisation could fit into a city structure that originates from the beginning of the 1900s. Working so closely together in this way, at such an early stage was new and will be continued as regular workshops. The City of Stockholm has set a goal to be fossil-fuel free by 2040. One of the biggest challenges in achieving this goal is to lower transport emissions in the City. In GrowSmarter we will be testing and implementing a range of transport measures at a relatively small scale in Valla Torg, Västberga and the Slakthus area. The plan is to evaluate them and see if they could be implemented in large scale in Stockholm. One of these is to get more efficient clean vehicles in Stockholm. 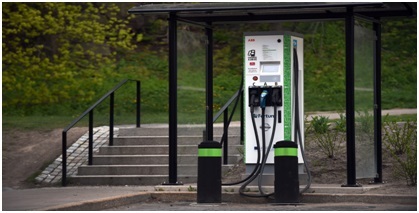 In GrowSmarter we support this with implementing new stations for biogas fuel, charging points (see picture), route optimisation for clean vehicles, apps for drivers, and synchronized traffic lights to give preference for clean trucks. Another important measure is a more efficient transportation of goods and waste. The preparations have included a building logistics centre, a smart waste handling system and the above mentioned synchronisation of traffic lights. A third important measure is reducing the need for travel and switching from cars to walking and biking. Here the preparations have included the consolidated big data platform, bicycle transports for light goods, an application for travel demand management, electrical car pools as well as electrical and cargo bike pools. All of these measures are going to be implemented during 2016. I will be back soon with more experiences with implementing the first smart solutions in Stockholm in the next blog, but please feel free to share your thoughts and experiences this far in Stockholm.